This article is an overview on how to add users to your server. The following topics are mentioned. You can add a new website user on the Manage Users page. Click the Add A New User button. An FTP user is required in order to upload a website you've created to DreamHost's servers, or to make changes to an existing website. The Manage Users page shows the username and the type of user it’s configured as. In the example above, the user is named ‘dh_user’ and it's an FTP user. Every website hosted with DreamHost is "owned" by exactly one FTP user. However, an FTP user may own more than one website. In that case, each site would have its own directory under the FTP user's root directory. 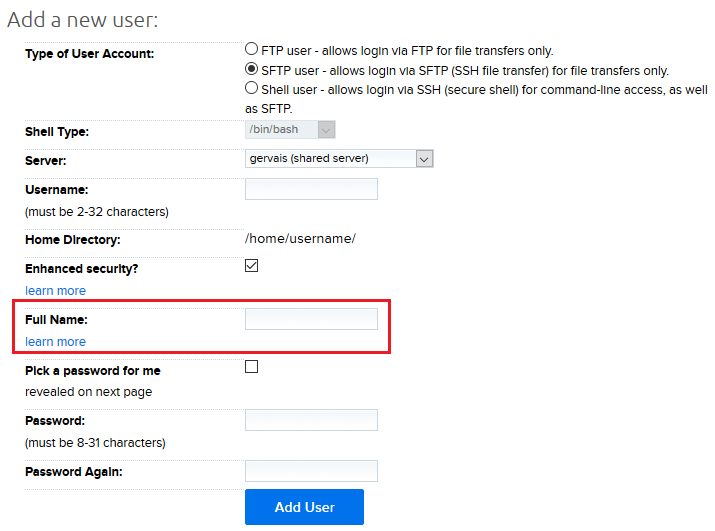 You can configure the account so that an FTP user only has access to one subdirectory on a DreamHost website. FTP is not considered a secure protocol since all of your traffic (including your login information) is transferred over the Internet in plain text, where anyone could eavesdrop. For more information, see FTP Security. For this reason, you should only create an SFTP or Shell user. SFTP users are similar to FTP users except that this type of user creates an encrypted connection to the server. Port 22 is used in your client to connect to the server via SFTP. Shell users are users who can connect via SSH, SFTP, and (optionally) FTP. The "Shell" is the Linux command line on your hosting server, a useful alternative for advanced users. Bash – stands for Bourne-again shell, and is the default shell on Linux and Mac OS based systems. Tcsh – is an enhanced version of the Berkeley UNIX C shell. It is a command language interpreter that can be used as an interactive login shell and a shell script command processor. Ksh – also know as KornShell, and is an interactive command line language that can provide access to the UNIX system as well as other systems on which it’s implemented. Zsh – a shell made for interactive use and is also a scripting language. When you add or edit a user in the DreamHost panel, there is a 'Full Name' field you must enter. This is technically referred to as a Gecos field and is used to store general information about the user in the user's password file. This field is separate from the actual Username field, although you can copy the Username into this field if you like. DreamHost does not allow users to enter domain names in this field as this would disclose too much personal information about the user. Most commonly, users enter their full name or any other name besides the domain name. You cannot leave this field blank although you may enter just a single space. Why does it say my name is already taken? On shared web hosting accounts, the "namespace" for usernames is shared across a fairly large cluster of machines. As a result, all the usernames created for FTP/SFTP/SHELL users must be unique across the whole group. Typically, common user names such as “admin” have already been taken so users may need to add extra characters to their user to ensure it is unique. How do I share website access with another user? Unfortunately this is not possible. View the One user per domain policy article for details. The steps to add a user to a VPS machine are the same as above. The following article walks you through this process. How do I add a user to my private server? If you need to log into your server via SSH, your username must be configured as a Shell user. View the following article for instructions on how to enable a shell user.